What turbo motor couldn’t use an extra 100 hp or so? Okay people, say it with me, if you want to make your LS more powerful, change the cam. A cam (and springs) should always be the first upgrade you make to any LS motor, as it is the last component that the otherwise perfect factory combination requires. Okay, maybe perfect is a bit of a stretch, but whether you have a 4.8L, 5.3L or even 6.0L, this logic still applies. Heck, even if you step up to the 6.2L, 7.0L or any of the factory supercharged variants, a cam swap is still the way to go. All you need to see massive gains on an LS motor is to replace the wimpy stock stick with something a little more potent. This is not to say that the other components don’t offer improvements, because they do. But the gains from things like cylinder heads, intake manifolds and even headers will be even greater once you have sufficient lift and duration in your corner. Besides, most LS guys are looking for the best bang for the buck, and a cam swap certainly gets the nod over cylinder heads or an intake upgrade. This turbo race motor was just the way we like-mostly stock. The SBE 5.3L featured only new head gaskets, ARP head studs and an LS6 intake. While we all understand that a camshaft offers the proverbial wake-up call to your sleepy, stock LS, what about a turbo application? I mean seriously, all you have to do is crank up the boost, right? Unfortunately, this often quoted statement is both right and wrong. True enough, you can certainly run a turbo on your LS with a stock cam. You can also increase the power if you crank the boost up from 8-10 psi (or more), but boost is a funny thing. Suppose we have a 5.3L LM7 fresh from the junkyard and plop it on the dyno. To allow installation of the Comp Cam, the factory 706 heads were treated to a set of Comp 26918 valve springs. Completing the package was a factory LS6 intake and stock throttle body. Because this was a turbo motor making basically twice as much power as a factory 5.3L, we upgraded to a set of Fast 89-pound injectors. The stock (high-mileage) rockers were retained for testing, though a trunion upgrade is always a good idea. Running it with the stock cam and headers, these EFI truck motors typically produced near 350 hp and 375 lb-ft of torque. If we add boost to this stock-cam combination, we see that the multiplier effect of boost can push our 350-hp 5.3L to as high as 700 hp at 1 additional atmosphere (1 bar) or 14.7 psi of boost. The multiplier works at any boost level, so if we run just .5 bar (7.35 psi), we can see a 50% increase in power, taking our 350-hp 5.3L to 525 hp (350 hp + 175 hp (350/2). If we see these kinds of gains, why then, would we want or need to change the camshaft? To get things started, we installed the factory LM7 cam in the turbo motor. Mildest of the factory offerings, the LM7 cam featured a .466/.457 lift split, a 190/191-degree duration split and 116-degree lsa. One thing we always do is replace the oil (and filter) on our junkyard race motors. The 5.3L received 4.5 quarts of 10W-30 Muscle Car & Hot Rod oil from Comp Cams. More of a thrown-together affair, the turbo system consisted of a custom 3-inch Y-pipe designed to feed a single turbo. Note the use of dual Turbo Smart waste gates for boost control. Feeding exhaust to the Y-pipe was a set of stainless steel turbo headers equipped with 3-inch v-band clamps. The answer to this question is also in the multiplier effect. We all know that replacing the stock LM7 cam with a performance grind can yield big power gains, but did you know those gains can be further multiplied under boost? Suppose we take our 350-hp LM7 and perform a cam and spring swap that improves the power output to 400 hp. The boost producer was a PTE 7675 turbo equipped with a billet wheel and 1.28 AR, T4 exhaust housing. Adding 50 horsepower from a cam swap is not unusual, but check out what happens when we add boost. Just as it did on our 350-hp version, running 14.7 psi of boost on a 400-hp 5.3L can double the power output, taking our 400-hp motor to 800 hp! That 50-hp gain offered by the cam swap can translate to an extra 100 hp under boost. The same multiplication works at lower boost levels, as we transform the 400-hp 5.3L to a 600-hp 5.3L with just 7.35 psi of boost (.5 bar). The take away here, as good as a cam swap is on a naturally aspirated LS, the results are even better under boost! Keeping things cool for our turbo cam test was an air-to-water intercooler core. Dialing in the all-important AF and timing curves was a Fast XFI/XIM management system. To show what happens when you perform a cam swap to a turbo LS, we needed two things, a 5.3L test motor and a new cam from Comp Cams. The test motor was easy, as we had one of several junkyard LS motors at our disposal. We chose a well-worn 5.3L LM7 that had been previously treated to ARP head studs and new Fel Pro head gaskets. Since this test motor was already sporting a factory LS6 intake from a different test, we left it in place. We did add a set of 89-pound Fast injectors and fuel rail to the mix as well as the Fast XFI/XIM ECU. The turbo system for the 5.3L consisted of a PTE 7675 turbo, ATW intercooler and a pair of Turbo Smart waste gates. Run first with the stock cam, the turbo 5.3L produced 601 hp at 5,600 rpm and 614 lb-ft of torque at 4,600 rpm. The boost curve started at 7.0 psi and rose to a peak of 11.0 psi. Next up was the Comp 273HR Cam. Offering a .610/.617 lift split, a 223/231-degree duration split and 112-degree lsa, the Comp grind was considerably more aggressive than the wimpy stock cam. Tubular headers were used to feed a 3-inch Y-pipe, while spent gases exited the turbo through a 4-inch exhaust. Boost pressure for the system was controlled by waste-gate spring selection and a simple Turbo Smart manual boost controller. This produced a peak boost pressure near 11 psi for both camshafts. Run first with the stock cam, the turbo 5.3L produced 601 hp at 5,600 rpm and 614 lb-ft of torque at 4,600 rpm. That this motor produced more peak torque than peak horsepower is a sure sign of a wimpy cam profile. Out came the stock cam and in went the Comp Cam. This was LS cam swap number 1,000,000 for me-or maybe it just seems like that many! Dialed in once again with the new Comp cam, the power output of the turbo motor rose significantly to 708 hp at 6,400 rpm and 644 lb-ft of torque at 5,200 rpm. After running the stock cam, we swapped in the new Comp profile. The Comp 273LrHR12 Cam offered a .610/.617 lift split, a 223/231-degree duration split and 112-degree lsa. This compares to the .466/.457 lift split, 190/191-degree duration split and 116-degree lsa offered by the stock cam. Cam swaps being easy on the engine dyno (even on a turbo motor), we had the Comp cam installed in no time. After dialing in the AF and timing to match the stock cam, we were rewarded with peak numbers of 708 hp at 6,400 rpm and 644 lb-ft of torque at 5,200 rpm. 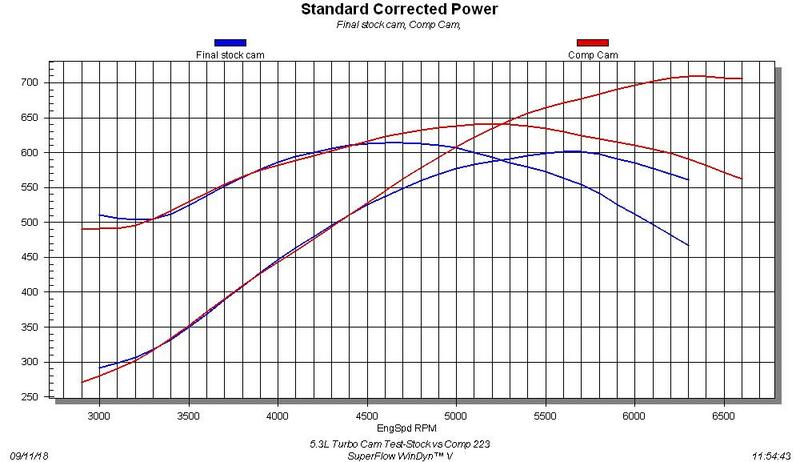 The boost curve dropped slightly with the new cam, ranging from 6.2 psi to 10.9 psi. This compares to 7.0 psi to 11.0 psi for the stock cam. As is evident by the power curves, the greatest gains came beyond 4,500 rpm, but instead of falling off past 5,500 rpm, the new cam carried the horsepower curve strong through 6,500 rpm. Even better, the cam swap netted an increase of over 100 hp on this turbo motor, and what turbo LS owner wouldn’t want an extra 100 hp? It looks like as good as a cam swap might be on a naturally aspirated LS, it’s even better with boost. By now, we need not be reminded that the LS platform responds well to cam upgrades, and this turbo 5.3L was no exception. The SBE 5.3L was augmented with only fresh head gaskets and ARP head studs, but we did opt to replace the stock truck intake with a factory LS6. Run first with the stock LM7 cam, the turbo motor produced 601 hp at 5,600 rpm and 614 lb-ft of torque at a peak boost of 11.0 psi. After replacing the stock cam with a Comp grind that offered a .610/.617 lift split, a 223/231-degree duration split and 112-degree lsa, the power output jumped substantially. Run with the new cam, the turbo 5.3L threw down 708 hp at 6,400 rpm and 644 lb-ft of torque at 5,200 rpm. The peak boost registered with the new cam checked in at 10.8 psi, though the boost curves generated by the two cams was decidedly different.